Adding texture to the walls will enhance your kitchen’s appearance, providing a little personality to a space that gets more guest traffic than any other room in the home. For many years, stainless steel was strictly the domain of restaurants and commercial kitchens, but as times and tastes have changed, consumers have come to appreciate the stylish ease of use that it offers. Steel is durable and virtually indestructible, while also providing the easiest of surfaces to clean. It also comes in a variety of finishes, which can be used to mask its appearance. Both extremely popular backsplash options, there are pros and cons of each to consider before making any decisions. Porcelain is a much denser material and less likely to absorb water, which reduces the likelihood of stains. It’s resistant to allergens and bacteria, making it a great choice for kitchen applications. Ceramic is a less expensive option, but equally attractive as porcelain and available in as many color and styles. The downside, of course, is that it’s less durable and resistant to water than it’s counterpart, and requires more maintenance to resist long-term wear and tear. *This featured blog combines with the previous article as the summer is a common theme. Keeping your house cool during the summer seems like a difficult task with so many factors. However, reading these tips will enable you to keep your bills lower and your house more comfortable. When purchasing a new air conditioning system, evaluate the size of the room and/or square footage of the home to make sure it has the ability to be energy efficient, based on your needs. If you have an older central air unit, consider replacing the outdoor compressor with a newer, more efficient model. There are a number of ways to keep your unit in tip-top shape long term. Clean the filter or replace it monthly (depending on the model and maintenance guidelines from the manufacturer) so dust and dirt won’t reduce air flow. In conjunction with your own maintenance routine, have an HVAC professional come in once a year to give your system a full tune-up. They’ll assess the unit’s current condition and provide recommendations for any additional maintenance and/or repairs. Try to keep the thermostat around 78°F and supplement air conditioning with ceiling fans. Keep the house closed up tight during the day and don’t air condition rooms you don’t use. Keep the use of heat-generating appliances including the stove, washer, and dryer, or dishwasher to a minimum, especially during daylight hours, and consider replacing any that put an extra burden on cooling the house overall. It may be beautiful outside, but when it’s warmer than normal keep those curtains pulled and the shades down during the day, particularly for windows getting direct sun exposure. Consider getting thermal or insulated drapes. To further keep heat and light from entering your home, have tightly woven fitted screens or bamboo shades installed on the outside of the windows. There are many ways to keep things cool on the home front this summer. Just be conscious of all the little things you can do that will add up to some real savings, and then sit back and enjoy the season! 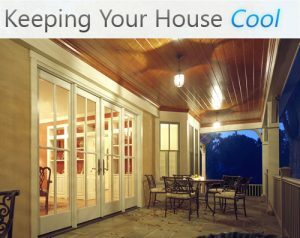 *These tips will enable you to be in control of your home’s climate. Take advantage and see the difference it makes in the heat of the summer. Your home will be significantly more comfortable, even on the hottest days.